If you want to get an A for your biology assignment, check out this article to find out everything you need to know about the animal cell and its structure. Cell biology has never been explained in such an easy manner. Your biology assignment may appear to be a tricky task. In order to get a great mark, you should understand the material properly. This article will help you find out what the animal cell is. Besides, after reading you’ll find it easy to describe the individual structure of this type of cell. According to the definition, animal cell is the dominant tissue cell in animals. As well as plant cells, animal cells have eukaryotic cell structure. They include a range of multicellular advanced membrane bound organelles. However, animal cells don’t have chloroplasts and a number of vacuoles. They don’t have the cell wall, so their shape is irregular. The size of an animal cell may range from 1 to 100 micrometers. This cell is surrounded by a plasma membrane which functions as a selective barrier. The plasma membrane allows nutrients to enter and some waste products to leave. There is one nucleus in an animal cell. It contains all the information that is needed for the growth and reproduction of the cell. 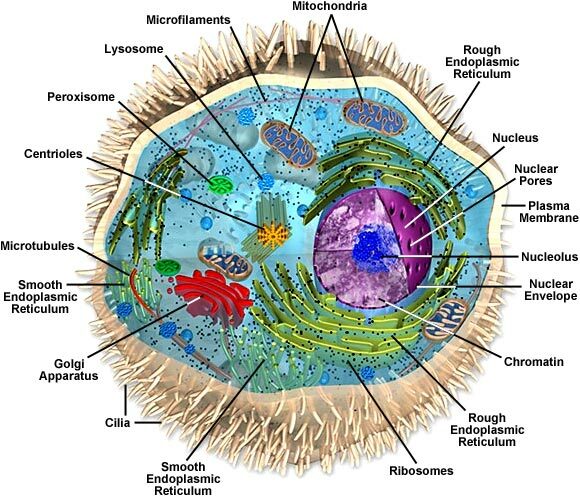 Each of cell organelles is surrounded by a membrane. As an animal cell is one of the basic notions of cellular and molecular biology, let’s find out more about its structure. A semi-permeable membrane surrounding the cell allows nutrients to enter. It’s the largest organelle in the cell. As it contains the genetic information, nucleus controls all cellular activities. These fluid sacs store food and different waste materials. Plant cells contain a bigger number of vacuoles that animal cells do. The main functions of Golgi bodies include storing, packing and shipping of certain particles in the cell. It consists of two subunits. One subunit reads the RNA. The other one forms a polypeptide chain. Messenger RNA defines the order of amino acids in ribosomes. Thus, ribosome functions as the site for protein synthesis. The main functions of this type of organelle are to fold protein molecules into sacs and to transport synthesised proteins into the Golgi bodies. It’s a double membrane-bound organelle, the main function of which is to produce the energy currency of the cell. Besides, the mitochondria convert glucose into ATP and regulate cellular metabolism. According to the biological definition, ATP is a nucleoside triphosphate that functions as a coenzyme. It transports chemical energy for metabolism in cells. Cytoplasm is a colourless fluid filling the cell. It contains the following elements: cytosol, organelles and inclusions. Cytoplasm keeps the cell stable and suspends organelles. Lysosomes are spherical vesicles that contain nearly 50 hydrolytic enzymes. These enzymes break down different biomolecules: proteins, nucleic acids, carbohydrates, lipids, and cellular debris. Thus, lysosomes digest waste materials and cellular debris. 1. What definition of an animal cell is the most suitable? 2. What are the main functions of the animal cell? 3. What parts does the animal cell consist of? 4. What are the main differences between animal and plant cells? 5. What characteristics does the animal cell have? If you have some other questions concerning the animal cell and its structure, a professional team of biology tutors can easily answer them. Feel free to contact us for any details.